I’ve figured it out. I can’t cook when it’s a full moon. Or when there’s recently been a full moon. Or on days that end in y.
I tried something different for dinner tonight and no, it was not a success. It was the opposite of a success. It was a calamity. Hubby bought a piece of salmon last Wednesday—he was supposed to make it on Wednesday and no one felt like salmon. He was supposed to make it Thursday and no one felt like salmon. He was supposed to make it Friday and no one felt like salmon. Saturday, I put the salmon in the freezer. I took it out a few days later, vowing that we would eat it this week. I explained to the family that we need to eat more salmon. 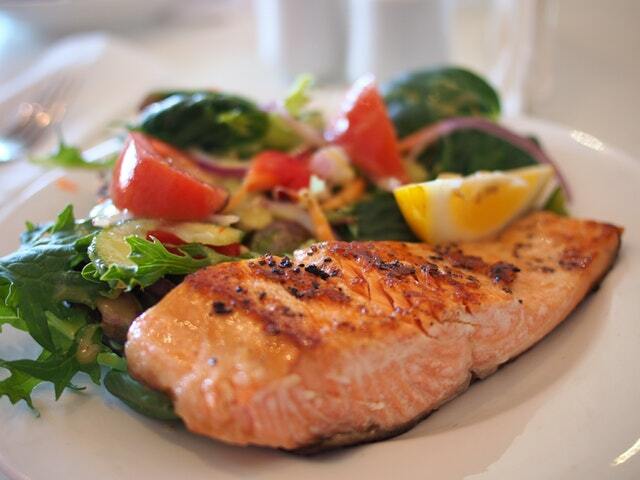 Salmon is really good for you, you know? It’s just not what my family considers an exciting meal. So they try to put off eating it as long as possible. Which is incredibly frustrating for the person trying to plan the meals and make sure everyone eats and gets enough Omega-3s and that they don’t die from malnutrition. I swore up and down that we had to eat this salmon by Friday (today). Hubby spent the better part of the afternoon trying to fix the lawnmower in the 90 degree, pollen laden outdoors (he’s not exactly handy, nor an outdoorsman) so I could hardly ask him to make the salmon. I would have to cook it. I have to admit, I got more than a little nervous—I’ve never made salmon. Hubby always makes it. And he does a good job, too. I’ve yet to encounter restaurant salmon that is as good as his. It’s hard to meet everyone’s salmon expectations when he’s set the bar so high. Anyway, I thought I’d try to air-fry the salmon. I’ve heard that people have good results in the air-fryer and it’s easy and delicious. 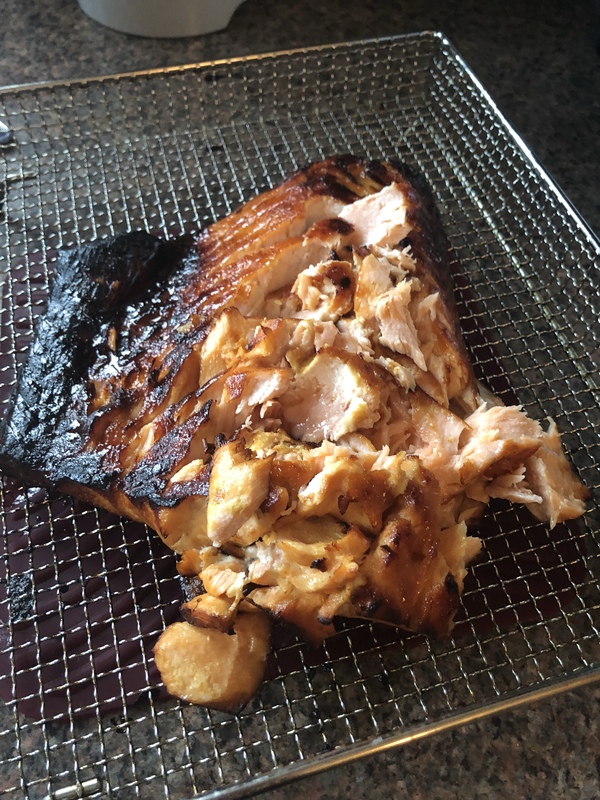 I checked Pinterest for some recipes and the people all gushed about how easy and idiot-proof air-frying salmon was. LIARS. Those people are not ME. The recipe I decided to use had honey, rice vinegar, sesame oil, and soy sauce. I made the mixture and marinated the salmon for 2 hours like it instructed. Then I put it in the air-fryer and went about making the rice. I have some sort of mental block with rice. No matter what I do, the rice is either too hard or too mushy. I feel like Goldilocks every single time I make rice. I just can’t get it right. Notice my salmon looks nothing like the yummy piece at the top of the page even though I followed the recipe to a T.
The rice was crunchy as well. The only thing I managed to get right was the steam it in the bag broccoli. I was nearly in tears. It was almost 7:30 on a Friday night—what the heck were we going to eat, and what was I going to do with this salmon and rice I cooked (and ruined)? #1. My dog doesn’t mind my awful cooking. #2. 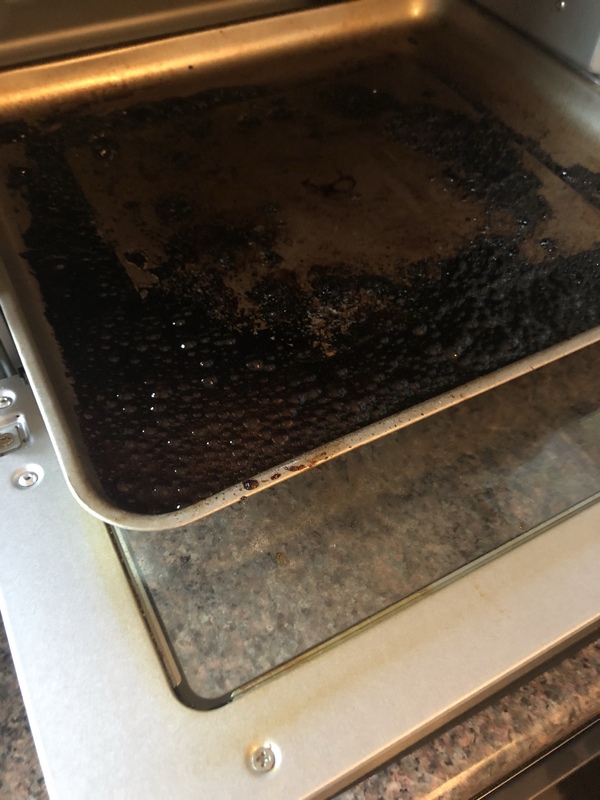 I was able to get the air-fryer tray clean. and #3. My local pizzeria was able to whip up two pies before Hubby even realized I burnt dinner. Lesson learned—no cooking salmon or rice for me. No cooking during a full moon week. Just order the pizza to begin with.